‘Life is not a cake walk.’ This statement stands up in the lives of many great achievers all throughout history. Life is an adventure. It is a mixture of many joyful experiences as well as melancholic moments. It is like a never-ending rollercoaster. We may get scared at some parts of the ride, nevertheless we keep moving forward no matter what. Sometimes the ride may also get bumpy and bouncy which can symbolize that our path is covered by obstacles and diversions. People have often heard the word obstacles but never managed to understand the true meaning of it. So, what are obstacles? 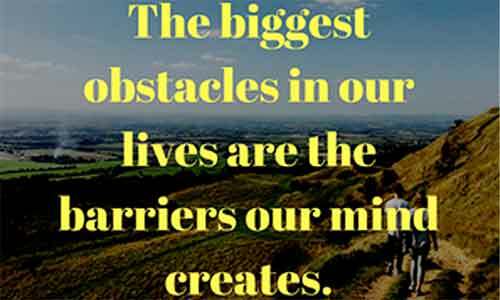 Obstacles are a common intervention in our lives that helps to build us up from the inside and make us stronger physically as well as mentally. In addition to this, obstacles also teach us how to adapt to different situations and therefore be more flexible in our lives. Diversions too occur a lot nevertheless we should be robust and not allow these objects to determine who we are. 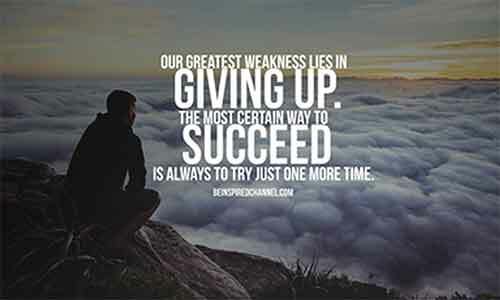 We must strive for greatness and adopt the never give up attitude. Many a times people stumble upon these obstacles in life or get diverted from their path towards success. This leads to various mishaps which in turn destroy the self-confidence of a person. Moreover, they lose all hope of achieving their goals. This shows how obstacles can pose as a huge threat for us and how we need to face all our difficulties in an optimistic manner. So how do we train our mind not to give way to diversions? First, we need to comprehend that life is only full of happy moments. It is in fact a mixture of both joyful and sad flashes. Nevertheless, we should show our constant dedication and determination towards giving our best to whatever we do. Sowing our uttermost commitment to any task that we carry out should be our main goal. We should never make excuses for the things that we do and carry out our responsibilities in time. We should never procrastinate. These actions help to give way to a new path of success. 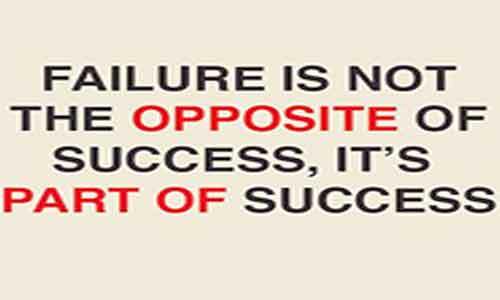 Secondly, failure is one of the main obstacles in life. An obstacle that keeps many people from achieving their dreams and aspirations. Therefore, we must learn how to stand up strong if we fall and crumble. In addition to this, we need to have that will power inside of us to push us forward and excel. Moreover, we should adopt that quality of always thinking positively and never give way to pessimists. Thirdly, we must learn to respect the decisions we might make and never keep our expectations too high for anything. We must do our best and learn that there is always scope for improvement in anything that we do if we dedicate and commit ourselves to it. Moreover, we need to accept everything that happens to us whether it be failure or success and know that many things in our lives come as blessings in disguise. These measures are the primary objectives towards paving a new path for success and prosperity. But the main procedure that truly will help us in our future development is self-confidence. The key to getting an upper hand in life is believing in yourself. This is traditionally a very hard quality to accept and implement. Nevertheless, we must practice developing our self-confidence even when times are tough and threatening. If there is a will, then there will be a way. This truly reminds me of one of my most memorable moments. Just a few years back, I took part in an elocution competition. Few days before the competition my stage fright got to me and I was so petrified that I resisted going on stage. But then one of my teachers came up to me and told me that stage fright is just an obstacle in life and that I had the potential to overcome it. She encouraged me to be strong and never loose hope in myself. This was quite enough to inspire and motivate me to get up on stage and in end I even managed to win second prize in the competition. This was a very striking experience which helped me to shed away my fears and become a stronger and more spirited person. Life is full of gleeful and melancholic moments. So, we need to learn how to always be grateful for whatever we have and be brave in every aspect of our lives. We must also carry out whatever work we do with effort and commitment and be determined to never give up. We must cherish every moment of our lives and live life with your head held up high. Only through this can we truly learn how to turn stumbling rocks into stepping stones of success.